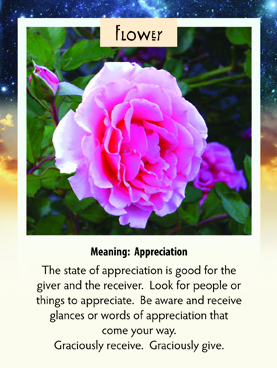 This week we have drawn the Flower card, which is symbolic of appreciation. No matter what difficult situations you MIGHT find yourself in this week, stop and look around for something to appreciate. The gift in doing that is that it will shift not only your energy but the energy of the situation. Isn’t that really amazing to know that you have that option! It is a choice you can make. React to what you perceive to be real and solid, or view it as an energy that can be shifted by your own. We just don’t understand yet how powerful our own thought/energy forms are. We are learning, and we learn step by step by application. I REALLY needed to hear this myself today…so am going right out to the yard to find a rose like this one (which grew in my yard a couple of summers ago) and spend a few minutes appreciating the beauty that is all around. Even if things are just fine this week, still try this and see if you feel the subtle difference in your energy. It’s like insurance against the potential of unpleasant encounters! And it feels great! Another great card this week. Like I have told you before, David and I receive many blessings from reading your cards everyday. The only times we miss is when we leave early in the morning. Thank you so very much. See you soon and can hardly wait.